I have been really meaning to compile and share some thoughts and experiences with everyone about Conor and Danny, whom are some of the closest friends that I have always had. Ever since I can remember these brothers have made me smile with their generous amount of laughing. This laughing has been an addictive phenomenon, in that everyone who happens to be in the presence of these Toumarkines, will undoubtedly smile and crack a bit of a giggle no matter what these young men are laughing at. As I have read these submissions that everyone has taken time to write, more than half of them mention the high octane giggles these guys put out. This phenomenon is something that I love to be a part of. Often when I am with the little nine year olds I coach at Squaw they mention; “you need to laugh more.” But in reality I am too busy making sure they are not jumping off of every rock on the mountain. What I need is the Toumarkine medicine, a nice song-like giggle that bounces off the tallest of walls and ceilings. I don’t laugh that often because these nine year olds make jokes that are for nine year olds. Here is an example; “So if a quiz is quizzical, a test is _____?” (you can figure that one out). This joke I actually did laugh a little at, and soon after told them to never mention testicles again. When it comes down to it I should laugh a little more, I am with a bunch of kids, so I should just act like one. Well here is a little information on laughter, which I believe to be one of the most effective ways a person can expressive themselves. People have an acoustically rich repertoire of sounds–with some laughs actually sounding more like bird chirps, pig snorts, frog croaks, or chimpanzee pants than human laugh sounds. — Humans produce a wide variety of laugh sounds with a remarkable range of pitch that, for males, can reach the highest pitch of a trained soprano. In females, pitches can be as high as twice those of a trained soprano. — Laughs can be separated into three basic categories: 1. Song-like laughs, which are akin to our stereotyped notions of laughter and are sometimes characterized by remarkably high pitch; 2. Snort-like laughs, with sounds that exit primarily through the nose; and 3. Grunt-like laughs produced through the mouth, but with no measurable vocal pitch. After this bit of research I realize that Danny and Conor both manifest the category 1 laugh, that of high pitched laughter. Personally I don’t know where I fit, but I have witnessed them all, and song-like is obviously the one everyone strives to create. Although, the snorter just allows others to laugh at them and in turn create more laughter. Well that is enough on laughter, and I’ll have to give it to the Toumarkines, they produce some of the most contagious feelings a single human can secrete. We all grew up riding at Cranmore and now we are all in Tahoe, making the best of what this world can offer in terms of that white magic we call snow. We occasionally get together to make some turns, but not nearly enough as we really should, and that’s gonna change. There has been talk of a ski date that all of MWV is going to be part of and I think we have the biggest posse in Lake Tahoe. Once Danny gets back on the snow he is going to be leading the pack with the rest of us eating his snow dust. Well I have been thinking about you guys a lot, your family, my family and everyone that is important to us, even the old dog I loved – Magic. And Danny, I think he left a little magic for you my man. Conor and Danny, you guys are good, good, good people and that’s why there are so many others out there reaching out to supply you guys with support and anything that needs to be done. This evening I am attending a birthday party for Steve Wallace and part of this get together is going to be dedicated to Danny with some fund raising to take place. The memories I have with you guys, your parents, your pets, the Penguin (which I loved when your dad was the main man there), are some of the best I will have and I will cherish them forever. 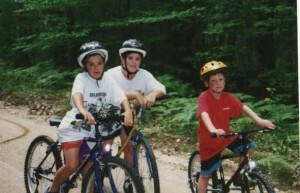 I have included a picture of Conor, Danny and I shredding old school on the mtn. bikes. If you look closely I think you can see remnants of Danny skiddin’ into the shot, shredding at an early age. That last sentence, matched with the picture… Awesome. The kool waters of Tahoe run over and through you. Get out of ICU and well soon! You need to come back and play on my hills! I am impressed by all of the reflections – expressions of feelings in such a positive, honest way such that we all come away better each time we read and think about Danny. The one constant that arises is that we have to stay close to family and friends; we have to remember that life is precious and tenuous. What is special now is I hear this sentiment indirectly but so clearly, in the memories and reflections, in great photos and hopes and assurances of good times to come.